I am most interested by your website but could you summarize for me as briefly as possible "the fundamental errors of scholarship" that you mention in the review section so that I can recommend the site to others. THE FUNDAMENTAL ERRORS OF SCHOLARSHIP Discussion Forum answer 1. In a nut-shell the fundamental mistakes of the scholars stem from four misunderstandings, first and foremost it is the scholars unwillingness to recognize Rembrandt's limitation: his inability to draw from his head, nowadays unhelpfully known as “imagination”. We have lauded this ability for so long that it has become a part of our culture but as far as Rembrandt is concerned it is a big mistake. is it not obvious that Rembrandt is saying - take no notice of this angel, I have not seen him! It is a joke. Rembrandt is taking the mickey out of Rubens and the like who produced these stereotypes ad lib. 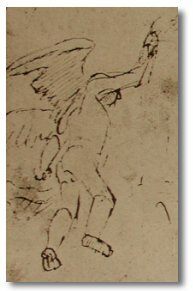 The second source of error is the dating of the drawings by style (example Hagar series). A third mistake stems from the attitude which tends to discount the human feeling (example: The Virgin and Child). Modern criticism looks primarily at the abstract qualities in a work of art. The fourth blind-spot is more technical. I am working on a DVD that will explain it: It is Rembrandt's unique sense of space, which is unmistakeable, and allows him to use a shorthand in drawing. May I take this opportunity to expand on Rembrandt's limitation. Rembrandt turned his limitation into the driving force of his art. He worked almost exclusively from observation “anything else was worthless in his eyes” as a contemporary Amsterdamer, A.Houbraken reports. As a result of this insistence Rembrandt developed the most formidable grasp of human expression. His art is recognised by people from all over the world: it is universal. Rembrandt has seen and held up for our inspection the body language that unites the human race. This is the centre-piece of his art and it too is largely ignored by the experts. When the reality is closer to the reflective surface the image is better and so is the drawing, ie Musicians, Mummers and The Lady in North Holland dress (Imagination). When the reflection is provided by a much smaller, glass mirror the drawing is better still; we cannot fault his self portraits! But what really turns him on is reality, either beyond his control in the street or best of all under his control, either in the studio or in some location, like The New Town Hall which was under construction for most of Rembrandt's active life in Amsterdam and seems to have been used for some of his more elaborate settings. Theatrical rehearsals provided a similar level of inspiration. Rembrandt was at his very best when he had one person posing for him in the studio. If the Lady in North Holland Dress was indeed his mistress, Gertje Dircz, as the drawing is inscribed on the back, then we can assume that love also played a part in the production of perfection itself. We see here a rising level of quality from rank bad to perfection and they all come from the master, limited as he was. I would not wish him otherwise. These categories are intended as a guide, they are by no means water-tight. We have seen in Solomon's acolyte and The Virgin's right hand that Rembrandt is not reliable. This too must be taken into account. I suggest that in future the good in the work under discussion should be the guide as to whether it is a Rembrandt and we should learn to accept the indifferent parts that are mixed in as a result of his limitation and what we might call his carelessness. Better to think of it as his focused attention - parts may be left out of focus! If I could mount an exhibition of the beautiful drawings once attributed to Rembrandt but which have been wrongly dismissed by scholars over the last 90 years but which now reside in the wrong boxes of the Rijks, The Boymans or The British Museums, the world would be flabbergasted by the folly that has been perpetrated in those supposed sanctuaries of art.